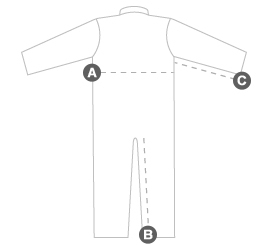 HO-380-M | UltraSoft Arc/FR Insulated Coverall | AGO Industries Inc.
Inseam: Measure from top of the inseam to bottom hem of the leg. Underarm Length: Measure along the underside of one arm from the armpit to the wrist seam. Chest Width 24" 24.75" 25.5" 26.25" 27" 28" 29" 29.75" 30.5" 31.5"
Under Arm Length 20" 20" 20" 20" 20.25" 20.25" 20.25" 20.25" 20.25" 20.25"